2016 has certainly begun with a bout of violent volatility in the financial markets. World stock market losses reached $8-trillion in the first three weeks of January alone, with investors fleeing to the perceived safety of government bonds on fears that the global economy could tip into a recession. I believe we are witnessing the early stages of the collapse of a 225 trillion dollar global debt pyramid (along with the Quadrillion dollar derivatives market). Whether it be China’s troubles, the faltering US economy, Europe’s inability to resolve the unviability of its periphery countries, plummeting oil prices or unprecedented levels of debt generally speaking, there are so many signs indicating that the world is about to enter a full scale major economic collapse. And importantly, many of the major central banks are now indicating that they are no longer prepared to keep propping up and inflating this horrendous global credit bubble. To the contrary, central bankers are now voicing their expectation for a major economic collapse in 2016. Oil Price Collapse – c) Negative impact on Russia and Saudi Why Russia can weather the storm. The problem facing the world is simple: for the past 20 years the world has used its “credit card” to spend wildly beyond its means, and many are waking up to the reality that there is no chance that the money borrowed can ever be paid back. Federal, state and local governments, corporations and consumers have all ratcheted up their debt- funded spending activities at a rate that is way above their growth in income. Everyone knows that such a policy is not sustainable in the long run, but thanks to central banking policy of “easy money” for so long, much of the world has been duped into thinking that this reckless debt-fuelled prosperity is somehow “normal”. However the truth is that you can’t consume far more than you produce infinitum. Eventually reality will catch up with you. We are experiencing the birth pangs of a full scale economic collapse, to be followed by an outright social collapse, which will result in a loss of confidence in most forms of money and investment, produce absolute chaos and bring the masses to outright poverty. Intensification of war (whether it be the “global war on Terror” or specifically between certain countries) is likely to occur simultaneously in order to distract and shift the blame away from those responsible for the bad economic management. From a “Big Picture” prophetic perspective, I believe what we are witnessing is the weakening of the Anglo- American monopoly control over global trade and finances (the “Merchants of Tarshish, with all the young lions” Ezek. 38:13). This is necessary for the realignment of nations as per Ezekiel 38, particularly if Europe is to align with Russia instead of its current status of bending to the will of the US/UK and placing economic sanctions on Russia. It is important to keep in mind that wars are an extremely expensive undertaking, and only possible with the backing of the central banks who decide whether or not to fund them. Since the time of the French Revolution the authority to create money and set interest rates on money was progressively removed from the ruling (typically democratically elected) governments around the world, and placed in the hands of the privately owned banks. The US Federal Reserve is a classic case of this – with respect to ownership and control there is nothing “Federal” about it – it has been in the hands of the private banks since its creation in 1913, and this explains recently why the major US banks continued to be bailed out at the expense of the US tax payers. From a non-believer’s point of view, particularly those comfortable with the materialistic society they are living in, a pending economic collapse is not a subject that they will feel comfortable talking about at all. However, from the perspective of a true believer, we should be lifting up our heads, because we know it means that the long awaited time of our redemption is very close indeed. “Your dead shall live; their bodies shall rise. You who dwell in the dust, awake and sing for joy! For your dew is a dew of light, and the earth will give birth to the dead. Come, my people, enter your chambers, and shut your doors behind you; hide yourselves for a little while until the fury has passed by. For behold, the LORD is coming out from his place to punish the inhabitants of the earth for their iniquity, and the earth will disclose the blood shed on it, and will no more cover its slain. (Isa. 26:19-21; ESV). Another scriptural precedent is the fact that Noah and his family, along with all the animals, were given 7 days to enter the Ark before the waters of the flood were upon the earth – “For yet seven days, and I will cause it to rain upon the earth forty days and forty nights; and every living substance that I have made will I destroy from off the face of the earth “ (Genesis 7:4-10). Hence, the world will face this major economic and social collapse – a time of trouble such as never was – only after we have been called to the judgment seat. 2016 could well be the year that everything changes for the world as we know it, but more importantly for us it could well be the year when we finally witness the return of our Lord and master. The serious phase of the economic collapse could be triggered by any of the events discussed in detail in this note. Ultimately major events in the Kingdoms of Men are ruled over God and the Angels (Dan. 4:17), so the precise timing of the full scale economic and social collapse is actually in the hands of our Father, as opposed to the evil rulers of this day and age. In His wisdom God may allow these times of relative prosperity to continue beyond 2016, as we know that He is “longsuffering” and “not willing that any should perish” (2 Pet . 3:9). There still remains much potential for many to accept the true saving gospel and be baptised, particularly in the mission areas, so it’s not a time to stop and fold our hands. We need to keep busy doing God’s work according to the best of our ability, preaching the gospel and encouraging our brethren and sisters, according to our individual circumstances and resources. No doubt the Angels have been very busy working on behalf of God to prevent the world from outright collapsing since the global financial crises in 2008. This has served the purpose of allowing many more people, some our own children and grandchildren, to respond to the call of the true gospel and be baptised. But it has also served the purpose of lifting the consequences of bad economic decisions to a much higher level, so that when the full scale global economic collapse does occur, it truly will be “the time of trouble such as never was since there was a nation” (Dan. 12:1). There is good reason to believe that we could be in a Jubilee year, the time when all debts are wiped out, and property is returned to its rightful owners. Hence, we ask: could this be the year when the debt and credit of the world is wiped out, and the Land of Israel (and ultimately the whole world) will be given to its rightful heir – even the Son of God, who God has “appointed heir of all things” (Heb 1:2)? So far 2016 has been the worst start to a year for global markets ever. In China, there were two emergency shutdowns of the stock market within the first four trading days of the year, and in the US the Dow Jones Industrial Average stock market index registered a record loss for the first three weeks of any year. The MSCI All-Country World Index has fallen 11% so far this year, and by more than 20% from the peak of the market in mid-2015. This means that roughly one-fifth of all the stock market wealth in the entire world has already been wiped out. The stock markets of many countries, including Saudi Arabia, Greece, Egypt, China, Russia, Brazil, Argentina Hong Kong, Spain and Portugal have fallen 30 to 40 percent from their 2015 highs. Another way of looking at it is that more than 50% of the “wealth” effect created from the 2011 lows to the 2015 highs has been destroyed, and this is despite the world’s central banks going into overdrive on money printing over that period. Global stock markets have been propped by enormous liquidity originating from an “ultra-loose” monetary policy by central banks all over the world – i.e. low interest rates and money printing (officially referred to as “Quantitative Easing”). As shown in the chart below, the balance sheet of major central banks has expanded by 10x over 1995 to 2015 to support this. The critical question right now is whether or not they are still prepared to continue injecting liquidity into the system to support the financial system and stock markets? The US Federal Reserve’s decision at the end of 2015 to raise interest rates (albeit by a fraction of just 0.25%) sent a negative signal to global markets that central banks may no longer be prepared to backstop the financial markets. Moreover, in early January the former chief economist from the Bank of International Settlements – the BIS – the central bank of central banks based in Basel, Switzerland, warned that “the world is now facing avalanche of bankruptcies” , and that things are about to become very uncomfortable for a lot of people who think they own assets that are worth something (See further comments in Section 3 below). To keep their economies growing over the last 20 years, the policy of governments all over the world has focused on borrowing money to stimulate consumer spending and industry investment in their economies. This has resulted in the world being able to report positive economic growth (5.3% p.a. ), but the outstanding level of debt that each country has to repay has grown at a much faster rate (9.0% p.a. ), as shown in the second chart on the right below. With $225 trillion credit outstanding on a worldwide basis, it looks likely that the world economy has reached “peak debt” for all practical purposes. 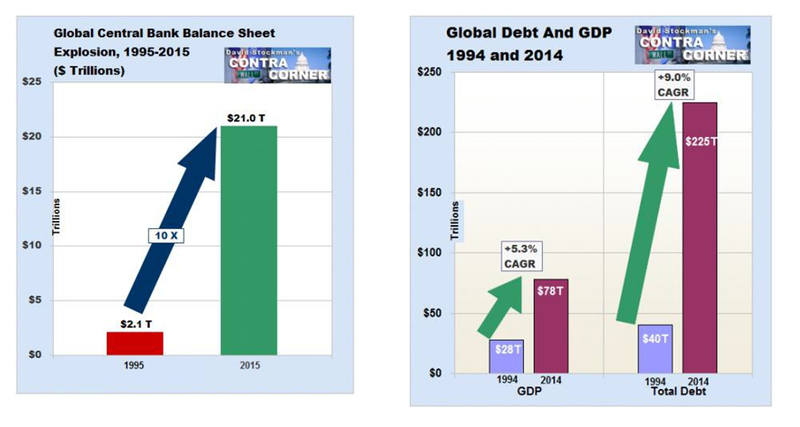 Much of the growth in global GDP, from $28 trillion in 1995 to $78 trillion in 2015, is a combination of a) household consumption growth funded by debt that cannot be sustained; and b) business sector malinvestments that will lead to losses and write-offs. So it looks highly likely that we have reached the point where borrowing does not create new wealth – it only mortgages future income – and this is the reason why central banks may no longer be prepared to grow their balance sheets and inject more liquidity to prop up financial markets. The only solution is a massive debt reset (or Jubilee) on a global scale. 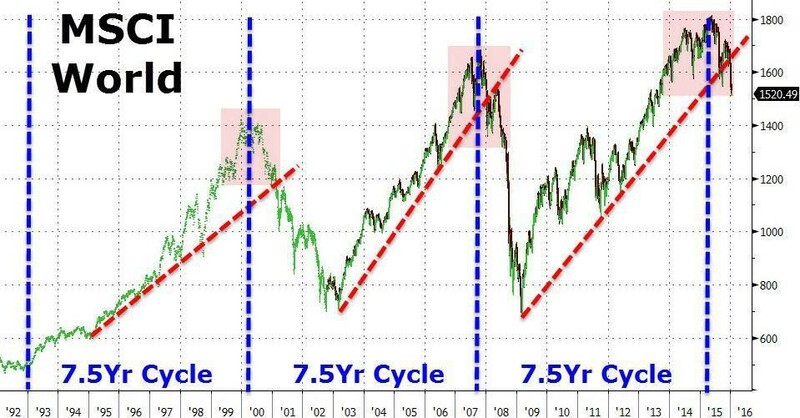 In this context, the great crash in commodities prices that is now underway does not represent some isolated low point in a cycle that will soon run its course and be gone; it is just the opening wave of a long-term asset deflationary epoch that is already generating a depression in capital expenditure (think BHP and Rio investing a whole lot less in their mining operations) and shrinking profits and wages in the sectors that have led the boom over the last two decades. Hence, global trade is absolutely imploding and shipping rates have fallen to unprecedented levels. If you can believe it, Bloomberg is reporting that it is now actually cheaper to rent a 1,100 foot merchant vessel than it is to rent a Ferrari. Sound’s totally unrealistic, but it’s a sign that we are living in one of the greatest financial bubbles in history, and this bubble is on the verge of being popped. The Baltic Dry Index, a measure of global freight rates and thus a measure of global demand for shipping of raw materials, has collapsed in January to even more dismal historic lows. The world economic forum that recently took place in Davos, Switzerland, was attended by a collection of over 2,000 global elites in the banking, corporate and political world. Guests include Nat Rothschild; Christine Lagarde (IMF); Mark Carney (Bank of England governor); Mario Draghi (ECB), Jim Young Kim (World Bank President); Queen Maxima of the Netherlands; Doug Flint (HSBC Chairman); Jamie Dimon (CEO of JP Morgan); Muhtar Kent (CEO of Coca-Cola), Bob Dudley (CEO of BP); Khalid al-Falih (Saudi Aramco); John Kerry (US Secretary of State) and Al Gore. Two prominent figures who received more than their fair share of publicity were billionaire fund manager George Soros and veteran Bank of International Settlements (BIS) chief economist William White. Both of them stated that the world economy is headed for a severe retraction in 2016, that “the world is running into something it doesn’t know how to handle”. They are casting most of the blame on China’s faltering economy as well as problems in Europe. While China and Europe’s problems are certainly a significant warning that a global economic collapse may not be far away, the root cause of the global chaos we are facing today is the unprecedented level of money printing by central banks (including China, Europe and the US) over the past 8 years. This has inflated an unparalleled expansion in debt and bad investments by governments, corporations, and individuals to levels that have no hope of ever being repaid. The Wall Street Journal when reporting on the economic forum in Davos ran a headline stating “Investing in 2016: ‘The Only Winning Move Is Not to Play the Game”, and went on to summarise the outcome of the conference as “The World’s Central Banks can’t save us anymore”. Actually, all central banks have done since the 2008 financial crises is to delay the day of reckoning by injection trillions in liquidity. Not only did this not end up in areas of the economy where it was not needed due to a complete collapse in demand, but the excess liquidity (easy money for those able to borrow) inflated asset prices to record levels. But now the world’s billionaires and central bankers are admitting that the day of reckoning is coming. The former chief economist from the BIS – the global central bank of central banks – William White himself stated that the only way out of this precarious situation is an outright economic collapse with a financial system reset – a debt jubilee – where all debts are wiped out (see further comments in section 3 below). This will cause havoc as most will be stripped of all their cash in the bank and financial assets. These unelected technocrats controlling the global banking industry are the true “financial terrorists.” When the collapse happens, it is likely that all of today’s fiat currencies, including the US dollar and the Euro, will be relegated to worthlessness via a hyper-inflationary environment as per the recent case of Zimbabwe. And what answer will they present to save the world when the economic collapse happens? You guessed it, more money printing, as plans are well underway for them to maintain their control over the money issuance and printing infrastructure. They are planning to introduce a totally new form of currency – something with global reach as opposed to being limited to one country or economic bloc. The BIS and IMF have long been planning the introduction of a new global currency – currently called the SDR (Special Drawing Right) – to replace the US dollar and the Euro. Both the Bank of International Settlements (BIS) and the IMF already officially account and produce their annual reports in the SDR Follow this link to see an example o f the BIS’s financial statements. The IMF’s home page shows their SDR interest rate and USD conversion rate. At the moment its value is calculated by a weighted index of a basket of 5 currencies – the US dollar, the Euro, the Pound, the Japanese Yen and the Chinese Yuan. The global central bankers fully intend to re-emerge in control of new financial system when the dust settles after a major collapse, which they are now publically warning is likely to occur this year. 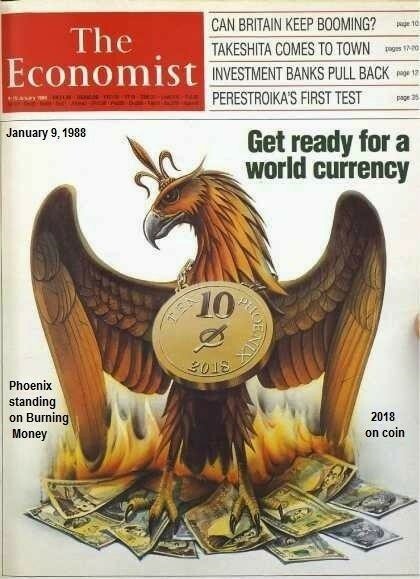 As the adjacent 1988 cover of the Economist Magazine clearly shows, these unelected technocrats (the “iron” components of Daniel 2’s feet of “Iron and clay”) have been planning this “world currency” for at least 24 years, and it’s very interesting to note that the date on the coin is 2018. Note also how all of the other “fiat” currencies are burning – so their new “Phoenix” currency is depicted as replacing all other currencies. It will be interesting to see if they change the name of this currency from the current rather technical “SDR” (Special Drawing Right), over to the simpler “Phoenix” as depicted in this illustration. To what extent this will be a truly “global” currency remains to be seen, but certainly we can expect it to start with the nations of Europe, and accordingly it is likely to be the basis of the European economy after Christ’s return, when the nations of Europe will give their power to the beast and try and fight against the lamb (Revelation 17 & 18). This same symbology of a phoenix rising from burning ashes was used in the closing ceremony of the London 2012 Olympics. 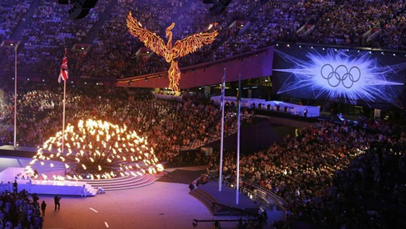 Given that Olympic ceremonies are one of the most viewed TV events on a global basis, it’s interesting to consider why this occult symbolism of a phoenix rising (or being reborn) from its ashes was chosen. The order of events at the closing ceremony explained it. When the phoenix was rising above the backdrop of all nations, a band by the name of “Take That” sung a song called “Rule the World”. At midnight, the light of the Olympic cauldron and the petals, representing each country, were slowly extinguished, but the phoenix, representing the “New World Order” stayed lit above it all. Such events are far from pure-coincidences, particularly when it is done on this scale and before such a large audience. A lot of deliberate planning went into this to convey a particular message – that individual sovereign nations of the world will slowly disappear, and a New World Order will emerge. Biblically this could fit into Daniel 2’s image standing up on its feet, led by the unelected “iron” rulers in Europe, stamping the residue and encompassing as many territories and nations as the 4 previous empires, if not more. Of course their plans to maintain their control over global finances will ultimately come to naught, as they will be crushed by Christ and the saints. “Debts have continued to build up over the last eight years and they have reached such levels in every part of the world that they have become a potent cause for mischief”. The European banking system may have to be recapitalized on a scale yet unimagined, and new “bail-in” rules mean that any deposit holder above the guarantee of €100,000 will have to help pay for it. It’s not often that you hear such a negative global economic view coming out of the mouth of a central banker in such a clear transparent manner. For example shortly before the US housing market collapse and sub-prime crises in 2007/2008, US Fed Chairman Ben Bernanke told the markets that there would not be a nationwide decline in home prices, and that the adverse effects of the housing market were “contained” and wouldn’t affect the broader economy. He was dead wrong on both counts. But here we have William White, the former chief economist of the BIS – the central bank of central banks – frankly admitting that the global financial system is dangerously unstable, admitting that it will be impossible for debts to be re-serviced or repaid, and that the banks, particularly in Europe, will have to be recapitalized on an imaginable scale. Deutsche Bank, probably the most important bank in Germany, just reported a huge $7 billion dollar loss for 2015, its first loss since 2008. The bank is the most highly leveraged in Europe (60 to 1) and has approximately $70 trillion of exposure to financial derivatives. Accordingly if Deutsche Bank alone were to collapse, it would trigger systemic contagion for all the other counter-parties (i.e. mainly the big banks) it has outstanding derivative contracts with. From my perspective the corrupt or evil part about this, is that they don’t intend to let their banking system collapse, but rather recapitalize the bad banks by confiscating the funds of depositors – as per all the new bail-in regulations they have introduced, and what is occurring to banks in Cyprus, Portugal and Italy. But I also found William White’s reference to a “Debt Jubilee” as part of the solution very interesting. This is interesting because based on the Jewish calendar, there is good reason to believe that we entered a new Jubilee year from 14 September 2015, which will last through to 2 October 2016. Biblically speaking the Jubilee year was inaugurated from the time the children of Israel entered the land under Joshua, and represents the period when a) all debt and credit is to be erased, and b) the land it to be returned to its original owners. Both of these aspects could well play out in this Jubilee year. The financial meltdown which started during the last 6 months of 2015 is now growing and making headlines all over the world. In all likelihood what we have seen so far is only the tip of the iceberg and the result will be an enormous amount of debt and credit will end up being wiped out this year. Moreover, we know that pervious Jubilee periods (1917/18 and 1966/67) witnessed remarkable events regarding the nation of Israel and the control of Jerusalem, and we hope and pray that very soon our Lord will return to redeem the saints and take control of Jerusalem. China itself is in a lot of trouble. China is the second biggest economy in the world. The worst-case (but nonetheless plausible) scenario is that a slumping Chinese economy will derail others around the world – from Emerging markets in Chile and Indonesia to industrial powers such the US, the EU (Germany), and Japan. Many countries like Australia have large markets selling raw materials and key manufacturing components to China. China has played a major role in propping up global growth since the Financial Collapse of 2008 (when the concept of free global markets stopped functioning, and we have been living with “rigged” markets ever since), by continuing to invest heavily in infrastructure and residential developments well in advance of what it actually needed. But to fund its economic growth, China’s debt has expanded by 60x from $500 billion or so in 1995 to $30 trillion today (that’s approximately 300% of GDP), with most of this debt held by China’s state banks. China’s reliance on credit-fuelled growth in the wake of the 2008 global financial crisis has resulted in one of the biggest debt expansions in history. Now it is becoming clearer by the day that China’s economy is slowing down and no longer able to prop-up global growth, and many are questioning the validity of its reported economic growth at the 6% p.a. level. China’s National Bureau of Statistics says its economy grew at an annualized +6.8% rate in Q’4. Economists in the US don’t buy it. More than 96% of respondents to the latest Wall Street Journal survey of 64-economists say the official data are manufactured to fit the government’s narrative. Translated, that means China’s financial system is mostly unstable and unhealthy. If it were otherwise, there would be no need for official statements to the contrary. Confirming this, at the recent world economic forum in Davos, Famous Hedge Fund Billionaire, George Soros (who made his billions when the Soviet Union collapsed in 1991), says that not only does he expect a “hard landing” in China (i.e. economic growth falling closer to 0% from previous 6% levels), but he’s observing it happening. Accordingly he is betting against the major Asian currencies this year. Nevertheless he believes China will manage to pull through their difficulties thanks to its “resources and greater latitude in policies, with $3 trillion in reserves”. Soros expects 2016 will be a “difficult year” in the markets, thinks the recent move to raise interest rates by the Fed was a mistake, and notably he revealed that he is betting against the US stock market. This week China responded by saying that George Soros will not win a currency (FX) battle with the central bank of China (the PBoC). At least that was Beijing’s message to the billionaire, as conveyed via a characteristically hilarious “op-ed” in the People’s Daily entitled “Declaring war on China’s currency? Ha ha”. “Soros’s war on the renminbi and the Hong Kong dollar cannot possibly succeed — about this there can be no doubt,” the People’s Daily stated, after calling Soros “the financial crocodile,” and blaming the billionaire for “increasing volatility in already unstable financial markets.” China is worried, because when a voice as influential as Soros says the “hard landing” is upon us, it has the potential to trigger more outflows at a time when more than a hundred billion dollars per month is exiting China for the perceived safety of foreign assets like high-end real estate in markets around the world including Australia. (China’s Capital Outflows Rise to Estim ated $ 1 Trillion in 2015 ). Which raises the question, what will happen to global real estate markets when the outflow of money by China’s super wealthy stops? It is likely to be very ugly. Contrary to the “everything is awesome” mantra often in the financial news media regarding the health of the US economy, a clear indication the US is in a lot of trouble is Walmart’s announcement that they have decided to shut down 269 stores (154 in the US, and 115 in Latin America), a decision that will negatively impact 10,000 employees. Another live indicator telling us that all is not well, is the fact that freight transportation in the U.S. is in steep decline, with freight companies pointing to a “glut in inventories” and a fall in demand as the culprit. Morgan Stanley’s recent freight transportation update indicates that the US is experiencing a collapse in freight demand worse than that seen during 2009. Also, another very troubling sign is the fact that initial jobless claims are starting to surge once again, with the number of the number of Americans applying for unemployment benefits in mid- January reaching a seven-month highs. The Panic of 2008 likely still dominates central-bank concerns. With the U.S. banking-system then on the brink of collapse, the Federal Reserve and the U.S. Treasury did everything in their power to prevent a collapse, irrespective of short-term or long-term cost. Systemic collapse was not viewed as an option. The economy has not recovered; the banking system is far from stable and solvent; and the Federal Reserve and the federal government still have no way out. Significant banking-system and other systemic (i.e. U.S. Treasury) liquidity needs will be provided for, as needed, by the Fed, under the ongoing political cover of a weakening economy—a renewed, deepening contraction in business activity. The Fed has no choice. Systemic collapse is not an option for the Board of Governors. This circumstance simply does not have a happy solution. Accordingly, any significant, renewed market speculation in the near future as to an added round of Federal Reserve quantitative easing, QE4, could become a major factor behind crashing the dollar …. The Fed has strung out its options for propping up the system as much as it thought it could, with continual, negative impact on the U.S. economy. Again, the easings to date, however, appear to have been largely a prop to the banking system and to the increasingly unstable equity markets. While higher domestic interest rates tend to act as a dollar prop, the hike in rates may trigger a round of other systemic problems. Again, there is no happy way out of this for the Fed. Despite an ever climbing debt level, the main reason the US is still rated at the top-notch ‘AAA’ rating by the major credit rating agencies, is simply because the world continues to trust the US dollar as the global reserve currency, and while so ever this remains the case the US has the unique ability to print money to pay off whatever level of debt it gets into. However, the caveat is that once there is sufficient evidence that global trust in the US dollar is waning, then the basis of the rating will revert to a normal fundamental approach based on the country’s ability to generate cash flow to pay off its debts, and accordingly the US rating will then in all likelihood be downgraded by multiple notches. For political reasons, I expect the markets will be panicking about the state of the US dollar, and pricing it a lot lower accordingly, well before the rating agencies get around to actually downgrading the rating. George Soros, in his Bloomberg interview, from the World Economic Forum in Davos, also voiced concern over the EU and its refugee crisis, and agreed with German Finance Minister, Wolfgang Schaeble, that another Marshall plan is required. “Greece is still a problem. It’s the one problem that has no solution, because it has been so messed up, that there is no — there’s — you can only muddle along. But there is no solution. And actually, that problem is now coming to the boiling point again. You can see it on the face of the press”. When such an important global financial spokesman as George Soros is publically relating such a negative view on the world economy, this means that not only does he fully expect it to happen but in all likelihood he is already well positioned to gain from it, just as he did from the collapse of the Soviet Union. His proposal for a new Marshall plan, this time to be funded by the nations of Europe, indicates a total restructuring of the EU that is more likely to be accepted post an EU financial collapse, and not before. It is my view that both the Euro and the US Dollar will both collapse, all related debts and investments will be wiped, that this will occur during Daniel’s prophesied “time of trouble such as never was” (at the same time as Christ will return to the household of faith), and during this time the global banking powers based in Europe will seek to maintain their control on an even large scale by implement a new “global” currency – the SDR – which they have been planning for some time (see Section 2). Clearly the EU continues to be in state of flux. In Europe, Portugal is starting to bail-in banks. This means individual bondholders’ investments and depositors’ savings are being confiscated to recapitalise the banks (as per what happened in Cyprus), and one ends up with a share of the bank instead of the cash they thought they would always have. This has negative implications for many other European countries including Spain, Italy and even Germany, as individual investors and depositors will become very nervous that their cash could be confiscated as well. In Italy bank stocks are crashing with Reuters reporting that investors are growing increasingly nervous about how the sector will cope with lower interest rates and a 200 billion euro ($218 billion) pile of loans that are unlikely to be repaid. As William White from the BIS in Basel, Switzerland, has warned, the only solution is for Europe’s financial system to be reset via a Debt Jubilee. Much of the current chaos surrounds the plummeting price of oil. Last week the price of U.S. oil dropped below 28 dollars a barrel as investors worried that the demand from China would drop and supplies from Iran would grow. Over the years, the price tends to fluctuate in response to geopolitical and economic turmoil. From the demand side, worries about China’s health and a global economic slowdown is weighing on oil (i.e. 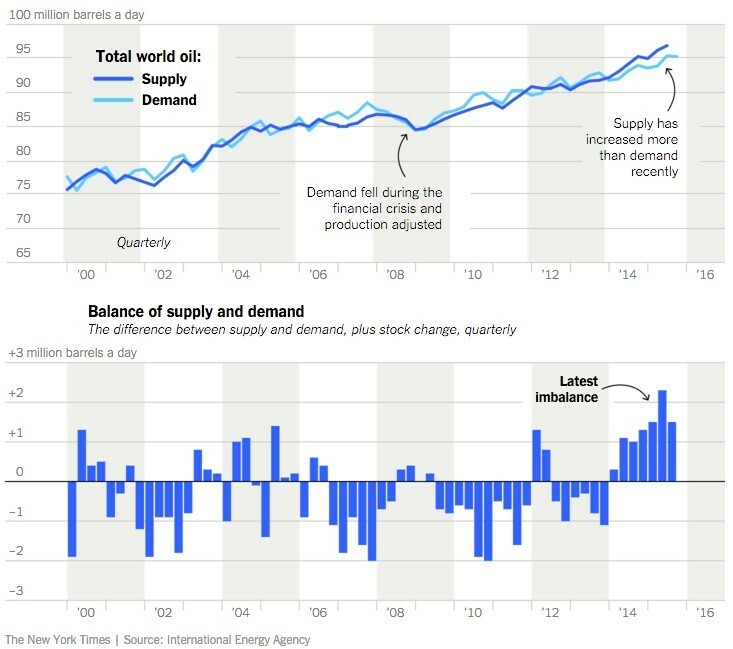 likely lower demand for oil going forward). From the supply side, United States production has surged in recent years as the shale boom took off. That has helped create a glut of oil as major producers like Saudi Arabia continue to pump at high levels. However more recently the Iran’s pending re-entry into the oil market following its historic nuclear deal and US- imposed economic sanctions being lifted will only increase the oversupplied state of global oil markets. Iran, home to 10% of the world’s proven oil reserves (4th largest), is targeting an immediate increase in shipments of 500,000 barrels a day, and plans to increase this to 1 million within months. Last Tuesday, the International Energy Agency (IEA) warned that the world could “drown in oversupply of oil in 2016,” with the lifting of sanctions against Iran allowing it to add 1-million barrels per day of exports to the global glut. On Jan 14th, Russia’s Energy Minister Alexander Novak said, “We have no plans to reduce oil exports in 2016.” And that comes after Russia exported a record amount of crude oil in 2015 (534 million tonnes). In 2015 the size of the global oil market was 95 million barrels per day, and with global supply at 97 million barrels per day, this means the market was oversupplied by 2 million barrels per day. This is enough to cause the drop in prices we have seen since the end of 2014. But now likely reduced demand from China, and increased supply from Iran will likely restrict prices well below $40 for most of 2016. Energy market watchers expect the global crude glut to persist through at least the end of this year, adding to stockpiles that in some places are testing tank limits. Venezuela looks like it will be the first oil-exporting casualty of the recent carnage in the price of crude, with investment bank Barclays pointing out that “After two years of inaction and the recent decline in oil prices, a credit event (i.e. bankruptcy) in 2016 is becoming increasingly difficult to avoid, in our view”. The country’s inflation rate is over 100% p.a, as the country’s currency has collapsed sending the price of imports sky-high, and the government has been printing money in bid to pay off its debts and compensate from significantly lower oil export revenue. Canada is also in trouble, as the country’s resource-sector dependent economy has been slammed by the low price of oil and other commodities, especially in Alberta, the heart of the country’s oil patch. The Canadian dollar has fallen to below 70 cents to the US dollar (from over 90 cents at the end of 2014), and this is having a profound impact on food inflation, given that the country has to import around 80% of its fruit and vegetables. The country is also burdened by record levels of household debt at 160% to GDP, the highest among the G7 advanced economies, which partly explains its overpriced housing market. Canada shed 35,700-jobs in November, and its unemployment rate increased to 7.1%. Bank of Montreal chief economist Douglas Porter recently told a gathering of leading economists that it’s going to be a very close call whether Q’4 of 2015 saw any economic growth. Porter said it looks like last year was one of the worst years for economic growth in decades outside of a full-on recession, and Canada is looking at a 2016 growth rate not much higher than last 2015. In the US, the low oil price is putting a tremendous amount of pressure on the junk bond (or sub-investment grade) market, particularly the bonds of US Shale-Oil companies who need the price of Oil to jump back up to the $80 level in order to be profitable. 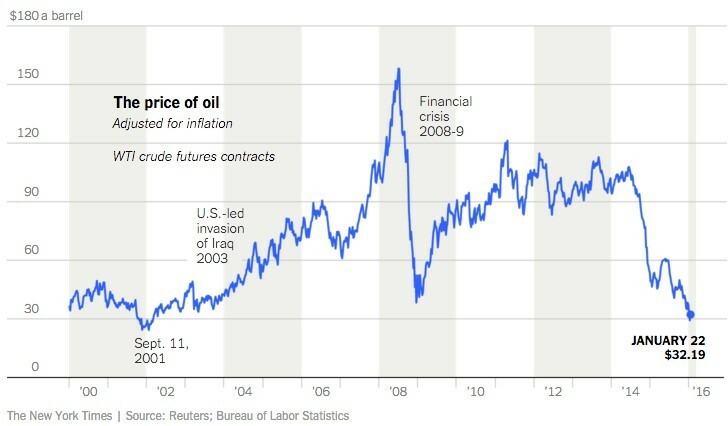 The oil price fall is shaping up to look a lot like the crash in US housing prices in 2007-09, and market commentators are warning that this could be the “smoking gun” that touches off the next financial crisis. Major banks and bond investors lent money to the Shale Oil companies when the price of Oil was over $100 during the 2012 to 2014 period. But now, many energy companies are having trouble paying back those loans, and it is fuelling anxiety on Wall Street and on world stock markets. It was recently estimated that around $250 billion in debt has been lent to companies who are now unprofitable with the price of oil at $30, and so there should be multiple bankruptcies going forward. Already 42 North American oil companies have filed for bankruptcy, and in so doing shed 130,000 jobs. Credit Rating Agency, Moody’s, recently placed 120 US oil companies on review for a possible downgrade, citing “a mix of declining prices …. weakening demand and a prolonged period of oversupply.” Another Credit Ratings Agency, Standard & Poor’s, warned that a stunning 50% of Energy Junk bonds are “distressed,” meaning they are yielding more than +10% more than the 10-year T-note, and are at risk of default. About $180-billion is distressed; – the highest level since 2009 and much of it is in energy companies. If only 10% of these companies file for bankruptcy in 2016, that would mean a doubling of the total amount of defaulted debt in 2015, and act as a shock to the entire US banking system. To stem the potential implosion on the US economy, recent reports indicate that the US Federal Reserve has given the permission for the banks to hide non-performing energy loans, and not to push any more of the troubled oil companies into bankruptcy. However, unless the price of Oil jumps back up to the $80 level, this will not solve the problem. Rather it’s just putting a band-aid over the problem and hoping it will go away. This is exactly what happened in the sub-prime crises in 2008 – the US government gave the banks permission to account for their sub- prime mortgages at book value (on the premise that real estate prices would return to previous high levels), thus preventing many other major banks going the way of Bear Stearns and Lehman Brothers. However, real-estate prices in the US have not recovered anywhere near to the 2007 market highs, and so this remains a festering problem for the US banks. 9. Oil Price Collapse: C) Negative impact on Russia and Saudi Arabia. Why Russia Can Weather the Storm. The fall in oil prices at the end of 2014 was triggered by US-backed Saudi Arabia no longer abiding by the OPEC agreement to limit the supply of oil, and deciding to flood the world with its oil. From the Saudi’s perspective, I believe two factors were at play: 1) The increase in supply from Shale-Gas Energy companies, particularly in the US, was limiting the amount they could sell in an environment where global demand was starting to decline; and 2) They knew that a low oil price would hurt Russia who was supporting the Assad government in Syria. Russia is heavily reliant on oil and gas revenues. Its economy has been mired in a deep and long lasting recession since Oct ‘14, as a result of collapsing crude prices and the economic sanctions placed on it by the US and Europe. Since the beginning of this year, the Russian Ruble has lost approximately 10% of its value in US dollar terms, and the currency lost approximately 60% of its value since May last year. Last week marked its steepest two-day decline in nine months, briefly falling to 86-roubles per US$. Accordingly the Russian government will need to borrow more money to fund its shortfall while oil prices remain at low levels. The last time oil prices dropped so low and stayed there, in the 1980s, the Soviet Union disintegrated. Some commentators are suggesting that Russia’s stash of foreign reserves will only last another 12-18 months if oil prices remain at current levels. Russian officials have been warning the population to brace for the worst. Both Alexander Novak, the energy minister, and Alexei Ulyukayev, economy minister, have appeared on state television warning of a protracted period of low oil prices. Mr Novak blamed low prices on an increase in production from Saudi Arabia, which he said had “destabilized the situation on the market”. And in the meantime, Putin continues to maintain an expensive operation in Syria. Hence, this indicates the high likelihood of Russia doing something about this problem in the short term. In Russia’s favor is the fact that it still has a very low level of debt compared to western countries, so it should be able to weather the storm of the currency wars that are taking place. Russia is slowly moving to overcome its dependence on “western” markets, by entering into agreements with nations to trade outside of the US dollar system (or the terms of trade dictated by the “MERCHANTS of Tarshish” and her young lions). Russia is already working with China, to settle crude exports to China in yuan instead of dollars, just as Russian oil is rising as a percentage of total Chinese crude This means they are determining the price of oil on a new basis outside of Wall Street’s Oil price monopoly. China is aggressively pushing its Silk Road Fund and Asian Infrastructure Investment Bank, with funding in its own currency, as a new alternative to the US-led “developed world” status quo, spearheaded by the IMF and World Russia, China, Iran and ever more developing nations, are now transacting with each other directly, bypassing the US dollar entirely. The BRICS countries (Brazil, Russia, India, China and South Africa) have made significant progress in setting up structures that would serve as an alternative to the International Monetary Fund and the World Bank, which are dominated by the S. and the EU. The five countries that comprise the BRICS have half of the world’s population. They can conduct their economic affairs without the dollar. China is placing pressure on Saudi Arabia to abandon its loyalty to the US Petro-dollar, and sell its oil to China in Yuan terms. (see further comments on this in section 10 below). Russia was beginning to work with the nations in Europe and entered into trade agreements with them based on Euros or Rubles (i.e. outside of the US dollar system), but post the removal of the pro-Russian government in Ukraine, and then the downing of Malaysian Airlines flight MH17 in July 2014, the Anglo-American powers have been successful in convincing the nations of Europe to stop trading with Russia via the imposition of economic sanctions. This is a case in point illustrating the power and influence over global trade and economics that the “MERCHANTS of Tarshish” are still able to exert. As we know prophetically that Russia will continue to grow stronger, and align with Europe, it is clear that the influence of the Anglo-American west on the global stage, including the US dollar’s command over global trade and its global “reserve” status, must decline in the very near future. Accordingly it will be interesting to see how Russia responds to this current crisis, and how they could possibly further turn it to their advantage. It all comes back to control of resources and control of money. The crisis in Syria illustrates this aptly. Saudi Arabia and Qatar want to supply their oil and gas through Jordan, Syria and Turkey and on to Europe. However, Russia, Syria and Iran are unhappy with this proposal as it competes with their economic interests of supplying oil and gas to Europe. Hence, the turmoil we have seen in Syria for the past 5 years, with “moderate” rebels funded by Saudi Arabia and Qatar, trying to overthrow the Assad government. The US has its hands tied, because it needs Saudi Arabia, as the largest oil producer in the world, to continue selling its oil in dollars (hence the term “Petrodollar”) in order to support the US dollar’s status as the global reserve currency. Accordingly, from this geopolitical and long term strategic perspective, both Saudi Arabia and the US have a vested interest in keeping oil prices low at the moment, even though for the short term this effectively means that both countries are bleeding as their respective energy industries suffer from low oil prices. Saudi Arabia posted three consecutive current account deficits (i.e. they are spending more money than they are receiving) over Q1 to Q3 in 2015, and this is likely to end up totalling USD $100 billion for the full year 2015. This contrasts to their historic record of consistently posting current account surpluses, and means that they are starting to burn through their foreign exchange reserves to pay for this shortfall. According to the IMF, Saudi Arabia’s fiscal breakeven; – the price per barrel of oil that it needs to balance its budget was about $106 /barrel in 2014, and it is estimated to remain at about that level for 2015. Nevertheless various experts estimate that the Saudi kingdom may be able to last up to four years before they run out of foreign exchange reserves. Hence the Saudi rulers are likely betting that they will be able to withstand the low oil prices longer than Russia and Iran can, and hence emerge as the winners. However, there are so many variable factors that make this far from certain. The Kingdom of Saudi Arabia is struggling on many fronts: they are losing their proxy wars in Syria and Yemen, their OPEC leadership is under threat, they are not winning the crude price oil war (particularly now with Iran back in the Oil market), and its long standing alliance with the West is in question. Washington’s non-committal stance on helping Saudi Arabia overthrow the governments in Syria and Yemen (in contrast to what the US did in the case of Iraq and Libya), as well Washington’s efforts to broker a deal with Iran, is telling Saudi Arabia loud and clear that US may not back them if a war were to break out between Iran and Saudi Arabia. Without military support from the West, Saudi Arabia knows it stands no chance of winning a war against Iran. The royal family will probably not take the risk of losing power by indulging in such a war. Iran is a much larger nation than Saudi Arabia by population and has held its own in numerous long wars. By comparison, the Saudis have an army that is inexperienced, led by loyalists of the Royal family who occupy plum postings. These are not the war-hardened generals of Iran. With China’s economy slowing there will be serious ramifications if China’s oil demand were to drop by a just one or two million barrels per day. This is because China is the largest importer of oil in the world, importing around 7 million barrels a day (on top of their own production of 4 million barrels per day – meaning total demand of 11 million barrels per day). Of late China has been taking advantage of the low oil price by importing record amounts of oil to build up its strategic reserves. Market participants are nervous that if China were to reduce its demand by just one or two million barrels per day, this would likely drive the price of oil into the teens. This would have huge knock-on effects on global financial markets, as many oil producing gulf states would be in serious trouble, and their $5 trillion worth of so-called sovereign wealth funds that they have invested in global stock markets and bonds would be liquidated to fund their shortfall from reduced oil revenues. (I believe Saudi Arabia is already doing this). The chart below shows where China has been importing its oil from over 2010-2014, with Saudi Arabia being the main source, followed by Angola, Russia, Venezuela and Kuwait. Notice how Russia’s proportion has risen steadily, and it is highly likely that Russia’s share increased further in 2015 at the expense of Saudi Arabia. 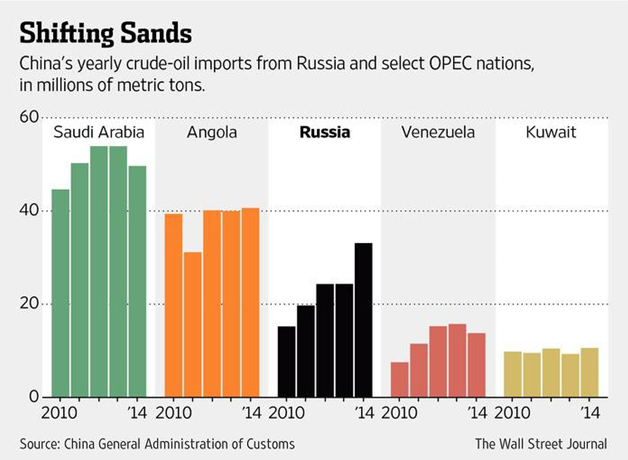 Russia’s proportion of China’s total crude-oil imports is on the rise. China is likely to import a dramatically higher proportion from Russia going forward, particularly given that Russia is now paying in Chinese Yuan. This will strengthen Russia and weaken Saudi Arabia and the Petrodollar. What is important to understand is the fact that since 2015 China and Russia are contracting for oil directly in each other’s currencies – i.e. not in US dollar terms. Historically, when nations such as Iraq and Libya tried to contract the sale of their oil in other currencies besides the US dollar, they were invaded by the US (under the pretext of removing dictators and spreading democracy). But the US is powerless to stop what China is doing. Hence, China has a powerful financial weapon that it is likely to continue using to weaken the “Petro-Dollar” and hence the US dollar’s status as the global reserve currency. Although China’s economy is in trouble, and hence its need for importing oil is likely to decrease, it would make sense for China to keep maintain or increase its oil imports from Russia where it is paying in yuan terms, and reduce its oil imports from Saudi Arabia where it has to pay in dollar terms. This explains the pressure that is currently on Saudi-Arabia to likewise agree to sell its Oil to China in Yuan, and not US dollars. Last week, President Xi of China met with Iranian leaders one day and then the Saudis the following day. The re-entry of Iran into the global oil market is giving Saudi Arabia massive headaches. The US has now lifted sanctions that were in place against Iran for the last 35 years. Along with this comes the ability for Iran to sell oil and they will now have access to up to $150 billion worth of assets and accounts previously frozen as reported by many credible non-government sources. We can only speculate what was discussed by President Xi of China with both Iran and the Saudis, but surely oil was the centrepiece. Naturally China wants to make and diversify oil supply deals from them both, and it is highly likely that President Xi told the Saudis that they would now have to accept yuan for settlement instead of dollars. There is no denying, the Chinese have done everything in their power to prepare for the dollar being dumped as the world’s reserve currency. You can argue about timing, but you cannot argue about “intent” as China/Russia have already set up non Western currency clearing facilities similar to the western SWIFT system (which is how the west can economically close a country down), but without any Western interference. Moreover Yuan clearing centre hubs have been established in major financial centres all over the world, China has negotiated bilateral trading deals with its major trading partners, positioned its trading banks all over the world, and even established gold and oil exchanges where the dollar will not be welcome. It’s a difficult decision for Saudi Arabia, and either way both Saudi Arabia and the US Dollar’s global reserve status looks certain to lose. If Saudi Arabia agrees to sell oil to China in non-US dollar terms then the status and image of the US dollar as the global reserve currency (backed by nothing apart from countries like Saudi Arabia insisting on dollars for their oil) will be shattered. Simultaneously, US military support for Saudi Arabia is likely to be withdrawn leaving them exposed to Iran. Alternatively, if Saudi Arabia maintains their policy of only selling oil in US dollars, then China is likely to reduce its imports from Saudi Arabia, and increase them from Russia (and Iran), which means that Saudi Arabia will have to sell more oil to other customers in an effort to compensate. In the absence of other geopolitical events that could disrupt the global supply of oil, this in turn will drive the US dollar price of oil down further, and wreak havoc on Saudi Arabia’s financial viability. As we know from Ezekiel 38 that “Sheba and Dedan” along with the MERCHANTS of Tarshish and its young lions will together oppose the invasion of Israel by the confederacy of nations including Russia, it seems more likely that Saudi Arabia will remain aligned with the Anglo-American or western powers. The negative consequences for Saudi Arabia will be the loss of potentially up to all of their oil revenues from China, and in turn the strengthening of one of their chief-rivals in the economic and global geopolitical arena – Russia. Post authored by Bro. Matt Jamieson. Christmas did not offer much good cheer to the world’s bankers, who have received a sustained kicking since the financial crisis erupted in 2008. In the latest blow, Switzerland announced that it would hold a referendum on a radical proposal that would strip commercial banks of the ability to create money, depriving them of a great deal of their profit-making capabilities. If the Swiss proposal catches on around the world, it could shred core business assumptions that have underpinned the banking model over the past three centuries. The next evolution happened when bankers realized that since depositors almost never simultaneously withdrew all their funds, banks could lend more capital than had been deposited. This allowed banks to “create” money in the sense that bankers could issue loans not necessarily backed up by hard deposits. Creating revenue in this way proved lucrative, but it brought banks into conflict with rulers, who were notionally in charge of the state’s money supply and any gains to be made from it. In England, whose financial system is in many ways the progenitor of today’s global system, this battle was played out between banker and ruler in the 16th and 17th centuries. Ultimately, in 1666 King Charles II — well aware of the limits of his own power thanks to the beheading of his father 17 years earlier — put control of the money supply into private hands. The privatization of the money creation process gave birth to the system we use today, in which private or commercial bank loans are responsible for 97 percent of the money circulating in the modern global economic system. In another change, 28 years after Charles II’s reform, an enterprising group of businessmen offered the government cheaper loans in exchange for certain privileges, such as a monopoly over the printing of physical currency, and so the Bank of England was born. The benefits of the new system proved immediately apparent. Interest rates on government borrowing dropped from 10-14 percent in the 1690s to 5-6 percent in the early 1700s. This allowed Britain a great deal of leeway when it came to military spending, which it soon put to use. But the privatization of money creation also came with drawbacks, namely the economic cycle of boom and bust. Leaving the money-lending and -creating decisions up to banks resulted in a system of extremes where bankers created speculative bubbles via vast quantities of loans and money when times were good, only to refuse to lend — in a sense destroying money — once an ensuing speculative bubble burst. This led to liquidity crises, with the South Sea Bubble of 1720 providing early evidence of this mechanism kicking into action. The fact that banks were lending more money than they could back up with capital also left them exposed to bank runs whenever the public lost confidence in them. The reserve ratio, which requires banks to keep a fraction of their loans backed by safer assets such as government debt or central bank money, is an attempt to keep this threat at bay. But it is an inherent characteristic of so-called fractional reserve banking that the risk of bank runs is ultimately inescapable. Britain, and indeed all the other countries that came to adopt the system, grew accustomed to a regular waxing and waning of the money supply and to the consequent up-and-down economy. There were ways to palliate this cycle, with the Bank of England slowly developing into the stabilizing force it is today. In times of crisis, the Bank of England would lower interest rates and flood the market with liquidity, bailing out any solvent but illiquid banks to keep the system functioning, thus smoothing the money supply’s wilder fluctuations. As British and then American influence spread, so did banks’ power, and capital flowed ever more freely around the world as domestic deposits were used to finance international projects. The system was heading for a fall, however, when World War I created great economic imbalances between Europe and the United States. In the 1920s, the Federal Reserve attempted to restore prewar parity by keeping interest rates artificially low, but this led to abundant speculative U.S. capital flooding across the Atlantic, particularly into Germany. The ensuing giant bubble finally popped in 1929, leading to the dramatic liquidity shortages of the Great Depression and creating the circumstances that culminated in World War II. The experience led to the partial reining in of banks, with the Glass-Steagall legislation in the United States in the early 1930s limiting their ability to take part in speculative investments. Time has a way of chipping away at such precautions, however, and the banks gradually escaped their shackles and capital came to flow freely around the world once again. More countries became accustomed to the ebb and flow of bubble and crisis, though these crises tended to be more regional in scope (e.g., Latin America, Asia, Scandinavia). When global crisis finally struck again in 2008 it was different from 1929 in that there was no world war to blame for the global economic imbalances; this crisis followed an extended period of the banks having had things pretty much their own way. Instead, it was a giant version of the regular crises inherent in the system. This led to the thinking that it is the banks, and indeed the system they created around themselves, that need changing. In the eight years since 2008, layer upon layer of 1933-style regulation and restriction have thus been heaped on the banking sector. But there also would be great risks involved, the main one being the fear of the evil unknown. Though the economic instabilities of the past 300 years appear to have resulted largely from the fractional reserve system, was it also responsible for the relatively breakneck growth over the same period? Moreover, the changeover from one system to the other would be extremely tricky, requiring vast quantities of central bank money-printing and debt buybacks. That would be a recipe for an extremely fraught period carrying immense risks of mismanagement. In truth, another full-blown financial crisis may have to take place before such a changeover could be made at the global level. But the theoretical upsides are great, as are frustrations with the current system, and the idea has begun to gather momentum. In 2012, the International Monetary Fund published an influential research paper laying out the case for the proposed system, and in 2015 the Icelandic government commissioned a report on the prospect of undertaking the changes. In Switzerland, a law requiring a referendum to take place should 100,000 signatures be gathered has set the country on a course to possibly being first to undertake the great experiment. Strikingly, the revolution is being considered at both ends of the spectrum: Iceland has lately proved among the most financially adventurous players on the global economic scene, while Switzerland has long been one of the most conservative. Considering the risks involved, adoption in a smaller economy such as Iceland or Switzerland would be a useful test case from a global perspective. It would limit the cost of failure to the global economy while helping establish the best way of adopting the changes should the reforms actually work. For banks, the prospect is of course nothing less than a nightmare scenario, especially coming on top of all of their existing woes. These have included not only increased regulation but also the threat from a disruptive new technology undercutting their basic model in the form of Bitcoin, the new electronic currency that emerged almost exactly as the financial crisis struck. While Bitcoin has suffered its own wild fluctuations in the eight years since its birth, the technology that underpins it, Blockchain, has truly historic potential. The architects appear to have created an electronic system in which both parties in a transaction can act with confidence without the need for an intermediary, though there is some added risk for the payer, since reversing transactions is more difficult than in traditional banking. The world’s banks therefore face both the prospect of losing their money-creation privileges, as well as a potential usurper threatening their long-established role as the middleman through which all capital must flow. As 2015 fades into 2016, it is hard to think of a time in the past 300 years when the banker’s position in society has been more at risk. The International Banking System Faces an Existential Threat is republished on the ProphecyandNews.com blog with permission of Stratfor. A few weeks back, we posted an article summarizing the very real fears of the World Bank and IMF about the upcoming Federal Reserve interest rate rise. It seems that two of these potential flash-points have been deferred till December. Why is the world so worried about an interest rate hike? Since the 2008 global financial crisis, many central banks have pumped money into the economy to create economic stimulus. That economic stimulus has failed unlike past occasions, but in the process it has also created a great deal of “cheap debt” – lots of high risk loans that are dependent on a low interest rate. The IMF is concerned that once the rate goes up, that defaults will begin to occur around the world, and particularly in emerging markets. At that point, the Treasury Department would only be able to pay the country’s bills with the cash it has on hand — which Lew expects to be roughly $30 billion. And that would not be enough to cover the bills on some days, which can amount to $60 billion. “We anticipate that our remaining cash would be depleted quickly,” Lew wrote in a letter to House Speaker John Boehner. Lew stressed if that happens, it would be the first time in the country’s history that the United States could not meet all of its obligations. The US Federal Reserve is likely to lift interest rates for the first time next week in almost 10 years. However, both the IMF and the World Bank have been consistently warning the US Federal reserve against such a decision. The Federal Reserve will cause “panic and turmoil” if it raises interest rates in the next few weeks, the World Bank’s chief economist has warned. “Talk to almost any banker, investor or hedge-fund manager today and one topic is likely to dominate the conversation: It isn’t Greece. The picture couldn’t be clearer; this is an event that has had many people worried for many months. Will there be turmoil and panic next week? We dont know. Many US evangelical pastors have been warning of a Shemitah collapse. Whether a financial crisis does or doesn’t happen, we have little reason to believe that there is any scriptural precedent for applying the Shemitah cycle to the US instead of Israel as it was originally intended. The Greek Prime Minister is up for re-election on the 20th of September. Polls suggest that he wont be voted in as originally expected which will put the latest round of bailouts under significant risk. This could also be a flash-point for significant change in the geopolitics of the Eurozone. Remember the Government Shutdown of 2013? Well the US House of Representatives passed a bill a few years back to end the crisis temporarily until the 30th of September 2015. Once again, republicans are gearing up to see if they use a shutdown as political blackmail. Isaiah talks of a time when there will be one great and final financial crisis. The Dow Jones 1000 point drop a few weeks ago is a reminder of Luke 17. As I write, Asian financial markets are easing from a night of financial turmoil in the US, although the Shanghai is still taking a beating. The Dow Jones dropped 1000 points last night and closed down 588 which is the 8th biggest daily drop in the history of the Dow. It was also the first time that the Dow has ever fallen by more than 500 points on two consecutive days. The Shanghai index had its biggest drop since the Financial Crisis, the Australian markets lost $70 billion yesterday and Europe also dropped at a record speed not seen since the GFC in 2008. A big question hangs over the heads of world governments and experts alike – How bad can this correction get? No doubt the next few days will tell. However, what we have seen over the last few days, is a mere sneeze in global financial markets compared to the financial cataclysm which will hit around or after the return of Christ. the creditor like the debtor. This quote is one of many verses in Isaiah 24 which describes the state of the world after the return of Christ, and before He is enthroned in Zion. Its a state of affairs where the value of currency has become worthless, where the global economy and financial system have been destroyed. The message of Isa 24 is that that time will come. When, we ask? There seems to be a precursor, a preface if you like to Isa 24, and that preface can be found in the Olivet prophecy. There are at least four parallels between the Olivet prophecy and Isa 24 which begs the question, did Christ have Isa 24 in mind when he spoke to his disciples? The Shaking of the Earth v11 – earthquakes in various places v7 – earthquakes in various places v19 – The earth is exceedingly shaken, violently broken, split open, reels to and fro. Signs in the Moon and Sun v11 – signs from heaven v29 – the Sun will be darkened and the Moon will not give its light v23 – The Moon is disgraced, and the Sun ashamed. The Gleaning of Fruit v30 – when they are already budding v32 – Parable of the fig tree – when the branch becomes tender and puts forth its leaves v13 – It shall be like the shaking of an olive tree, the gleaning of the grapes. Mirth & Drunkenness v3 – Take care that your heart be not weighed down by carousing, drunkenness, cares of this life v38 – Eating and drinking and giving in marriage – until the coming of the son of man v7-9 – Merry hearted sigh, the mirth of the tambourine ceases. The noise of the jubilant ends, the joy of the heart ceaseth. They shall not drink wine with a song, strong drink is bitter to those who drink it. Note that Christ alludes to aspects of Isa 24 in the future tense, whereas Isaiah speaks of these parallels in the present tense because Isaiah was speaking as he envisioned it. And as it was in the days of Noe, so shall it be also in the days of the Son of man. They did eat, they drank, they married wives, they were given in marriage, until the day that Noah entered into the ark, and the flood came, and destroyed them all. Luke 17 warns of general prosperity in the last days before His return. Isaiah 24 describes the devastation that has been brought upon the global economy after the return of Christ. Take care that your heart be not weighed down by carousing, drunkenness, cares of this life.